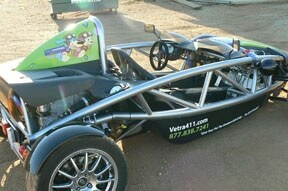 The Ariel Atom has new clothes! I bought a spare set of body panels from Brammo. 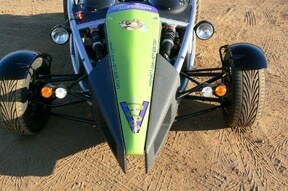 As I mentioned in a previous post, I was lucky enough that Vetraceuticals had said they were willing to sponsor the Atom. 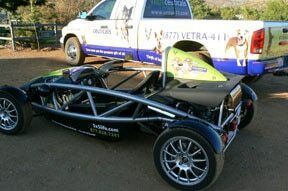 Andrew Lofts, the CEO was really into this idea, first because I had taken him for a ride in it – from which I think he still has the shakes!, and second, because he saw what an incredible attention-getter the Atom is. I wanted to do something special in the way of a design as I didn’t think it was good enough just to put a logo on the Atom. Like the car itself, I wanted something more unique. I was really pleased with the characters as they were just as I thought they would look – complete with flying helmets! I was nervous about adding the wrapped panels as obviously it changes the look of the Atom completely. Having seen them in the flesh, I think they worked out great and I will still use the burnt orange panels on the street and at other shows. Mix and match! 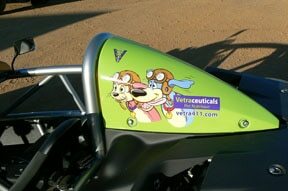 My Vetraceuticals business allowed me to afford my goal of owning an atom, and it’s become a true win-win as their sponsoring of the car has made it an even better attention-getter and really has driven up the hits on the website massively, both for the Vetraceuticals site and for a site I have built separately called 5x5life. I’ll update with some better pics when I have her out at her next show. It’s time that the Atom went out and earned her corn! I think if nothing else we’ll get a lot of recognition for Vetraceuticals and 5x5life. 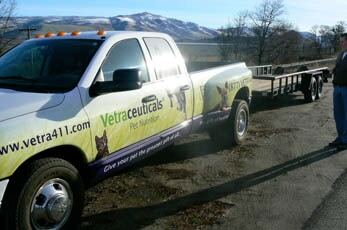 I knew nothing about vehicle wraps before the truck was done, but it really is a fantastic way to get images and details onto a vehicle without the permanence and cost of a paint job.